What is not to love about this amazing bathroom? A Master bath that makes a huge statement without being palatial. This has to be hands down our favorite bathroom renovation of 2018 — let’s walk through all of the best features. 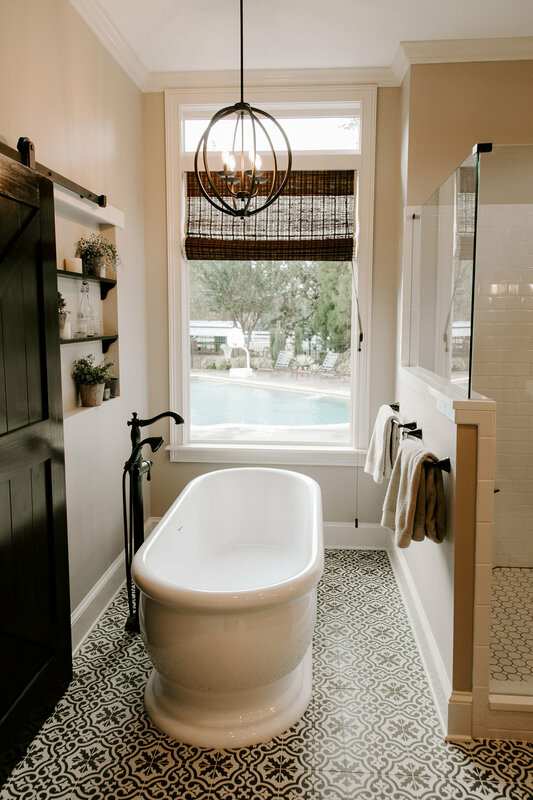 The stand-alone soaking tub evokes times of yore — especially with freestanding faucet and hand held sprayer standing like an old fashioned telephone. The picture window allows the natural light to flood the room, with bamboo shades to provide privacy. The bathtub’s simple lines and silhouette provide a perfect balance to the show-stopping pendant layering on the light for evening soaks by ‘candle’ light. 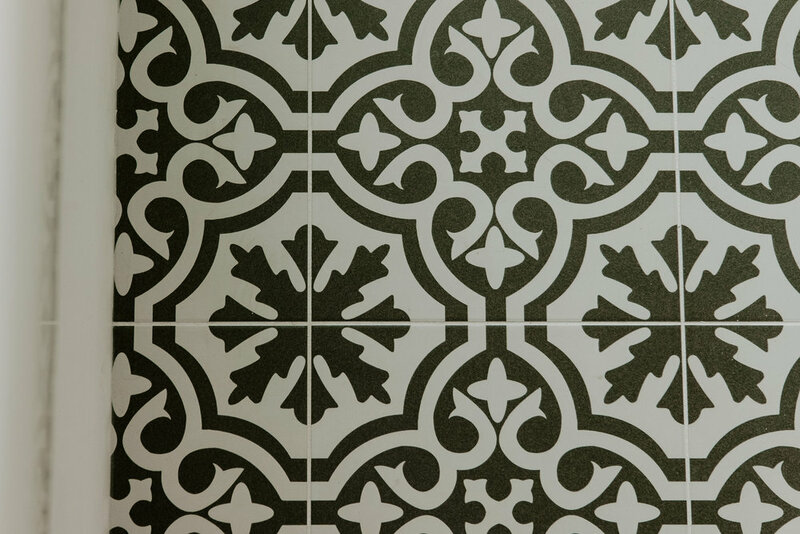 The black and white arabesque tiles prevent the room from fading into a fog of neutrality — this pop of pattern in fact make the modest bathroom appear larger. Cabinets in a deep capuccino finish with bronze hardware (no knobs here!) look both classy and vintage. Echoing the the lighting & faucet fixtures in antique bronze, these Shaker style cabinets are show-stoppers in their own right. 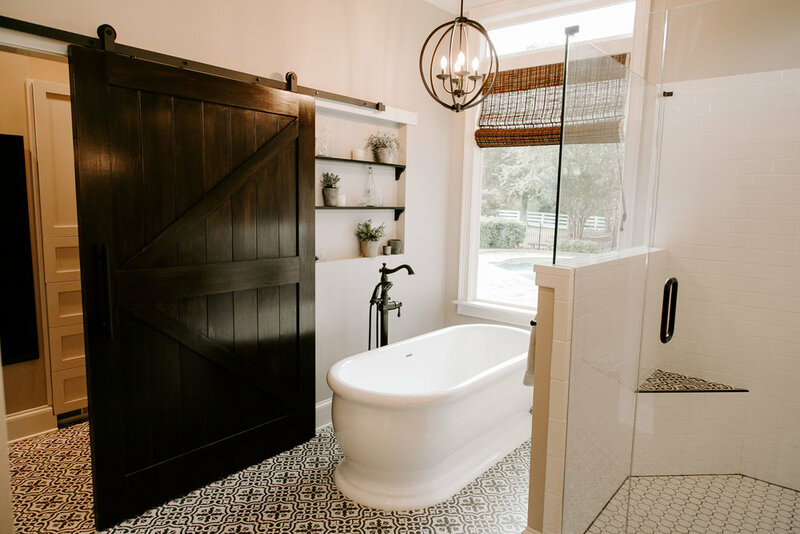 What more needs to be said — a barn door is the perfect choice both in style and function. No account for door swing needs to be taken — this door maximizes the square footage on the floor and uses the extra wall space. 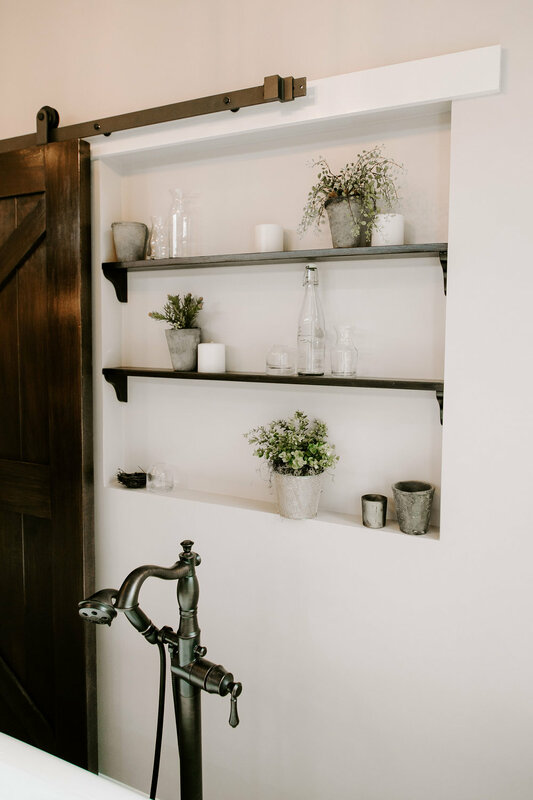 And lastly, the layer which brings life right into this design space — the succulents placed on a inset shelf providing storage while not impacting the sliding door as it moves. We created this space in conjunction with a designer, Caren Denneman. Our goal is to craft creative, custom solutions for every space in your home! Let us know how we can help you!